SharePoint lists and libraries contain list forms that allow users to display, edit, and add items to a list or library. 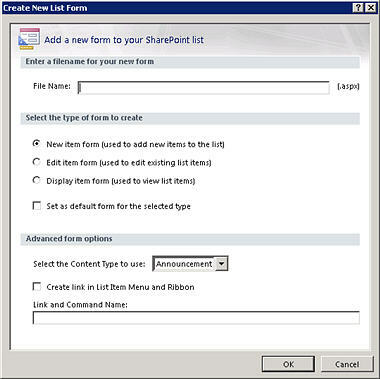 With Microsoft SharePoint Designer 2010, you can create and customize these forms to make it easier for users to add and update items in a list. If the list form is part of a solution you've designed, you'll want to customize the form so that it's targeted toward the solution and collects the relevant data to support your solution. In a custom list form, you can show or hide certain fields, reorganize those fields, change the layout of the form, add formatted text and graphics, and ultimately, change the XSL, HTML, or ASP used by the form. You can only perform these tasks by creating a custom list form in SharePoint Designer 2010. This article describes the default forms associated with a list and how you can create your own custom forms for the list or library. NOTE If you’re using SharePoint Online, and the information in this article doesn’t match what you’re seeing, you may be using Office 365 after the service upgrade. Some features in SharePoint Designer are not supported in the next version of SharePoint Online. 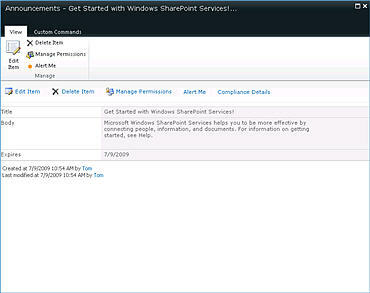 List forms are located in the same folder as their associated SharePoint list. Using SharePoint Designer 2010, you can quickly and easily review the default list forms associated with the list. The easiest way to view the default forms associated with a list is to open the summary page for the list. With your site open in SharePoint Designer 2010, click Lists and Libraries in the Navigation pane. Click the desired list from the gallery, for example, Announcements. On the summary page, under Forms, you see the forms associated with the list. Another way to view the default forms associated with a list is to open your site hierarchy using the All Files tab in the Navigation pane. With your site open in SharePoint Designer 2010, click All Files in the Navigation pane. NOTE If the All Files isn't visible, contact your site administrator about enabling your web site structure in SharePoint Designer 2010. 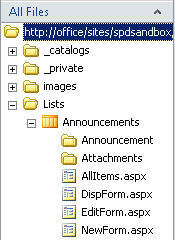 For SharePoint lists, click the Lists folder and then click the desired list, for example Announcements. NOTE In addition to viewing and opening forms from here, you can use the site hierarchy that displays below the Navigation pane to explore the list. Just click the click the plus sign (+) to expand the Lists folder and the plus sign (+) to expand the desired list. For SharePoint libraries, open the Shared Documents folder and then the Forms folder to find the associated forms. By default, there are three forms associated with a list: DispForm.aspx, EditForm.aspx, and NewForm.aspx. The following three illustrations show the default list forms for an Announcements list. The DispForm.aspx page provides the Display Item form that appears when you view a single item from a list. The EditForm.aspx page displays the Edit Item form that appears when you edit an item in a list. 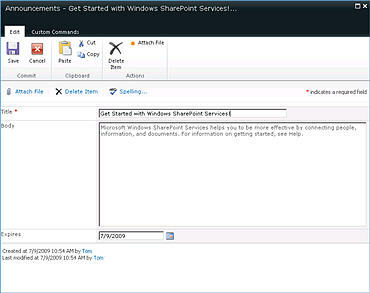 NOTE SharePoint libraries use a different form, Upload.aspx, instead of NewForm.aspx to add new items to the library. 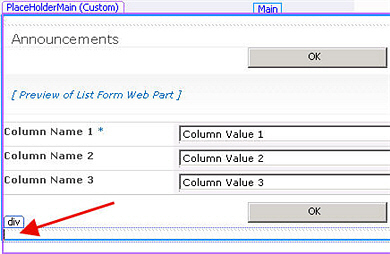 The default list forms (the Display Item form, the Edit Item form, and the New Item form) are stored in a Web Part called the List Form Web Part (LFWP). The LFWP uses CAML (Collaborative Application Markup Language) to render the form, and this cannot be customized in SharePoint Designer 2010. To customize the form, you insert a Data Form Web Part (DFWP). It uses XSLT that can be customized in SharePoint Designer 2010. In sum, you're replacing the default form with a DFWP, and there are two ways to do this. The easiest and quickest way to create a custom list form is to create a new form and make it the default form for the list. On the summary page, under Forms, click New. NOTE Alternatively, you can click List Form in the ribbon on the List Settings tab. For the type of form, specify New item form, Edit item form, or Display item form. To make this form the default form associated with your list, click Set as default form for the selected type.When you do this, your custom form will be used for this list instead of the original default form. For advanced options, choose the content type to use for the form, typically the one that corresponds with your list. NOTE Every list or library can be configured to allow multiple content types, which then appear in this menu. You can use a distinct set of custom list forms for each content type available for a list or library. For example, if your list has both a Press Releases content type and an Industry News content type, you can create and use two separate sets of custom list forms, one for each of the two content types. The advantage to using a separate set of custom list forms for each content type is that then each custom list form is designed to display only the fields that are appropriate for that content type. Find more information about content types in the See Also section. To add a custom link to your form, select the option Create link in List Item Menu and Ribbon and specify a link and command name. Find links to more information about custom actions associated with a list in the See Also section. Click OK to create the new form and return to the summary page for your list. Your new form appears with the other forms associated with the list. Another way to create a custom list form is to directly edit one of the default forms associated with the list. When you do this, you insert a new form (the Data Form Web Part) on the page that replaces the default form on the page. NOTE You could, in effect, perform these steps on any ASPX page in SharePoint Designer 2010. The advantage of editing an existing form is that it is already associated with the list. On the summary page, under Forms, click the desired form, for example NewForm.aspx to open it for editing. With NewForm.aspx open in the page editor, place your cursor immediately below the default form and pressEnter a few times to create a extra spaces below the form. Another way to quickly place your cursor at this location is to click on the default list form and press the Escand right-arrow key at the same time. On the Ribbon, click the Insert tab and in the Data Views & Forms group, click the desired form, for exampleNew Item Form. Choose the list or library you want to associate the form with, for example, Announcements. The New item form appears on the page, directly below the default form. The next step is to hide the default list form so that only your new form appears on the page. This also ensures that the page's connection to the SharePoint list is intact, and the link to this page works correctly on the site. Click the default list form to select it. Click the Format tab in the Ribbon and in the Web Part group, choose Properties. Alternatively, you can right-click the default web part and choose Web Part Properties. In the Web Part dialog box, click the plus sign next to Layout, check the option Hidden, and click OK.
Do not delete the default web part in the page; you must only hide it. Deleting the default web part will break the page's connection to the list. Find links to more information about hiding Web Parts in the See Alsosection. Both forms display on the ASPX page in SharePoint Designer 2010. When you preview the form, however, you see only your new form.